Using hydrogen peroxide is perfect to remove mould from porous materials like clothing, walls and wood, unlike other more aggressive alternatives like bleach. Hydrogen peroxide can be quite harsh, it’s a mid-strength solution- not quite as strong as bleach, but not quite as weak as vinegar or baking soda solutions. It’s important to note that hydrogen peroxide has a mild bleaching effect, so it can lighten colours on fabrics and other surfaces. However, it is non-toxic and leaves behind no residue or fumes. You can find hydrogen peroxide in most chemists, look to find some with 3% concentration. Penetrates surface of material better than bleach. 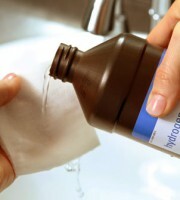 Mix 2 parts water and 1 part 3% Hydrogen peroxide into the spray bottle. Shake well, and spray generously over the affected area. Allow solution to sit for 10 – 15 minutes- it will start cleaning naturally. Wipe away any mould debris and allow to dry. While Hydrogen peroxide is non-toxic it can cause irritation to sensitive skin, so it’s always recommended to wear safety gloves.